Midway Village Museum’s award winning outreach program will engage 3rd grade students by providing hands-on learning experiences related directly to life in Northern Illinois from its early settlement days to the present. The curriculum focus is on the primary social studies unit of what makes up a community. To learn about how this program can integrate into your curriculm, download this PDF file to assist Third_Grade_Curriculm_Standards_for_Educators. 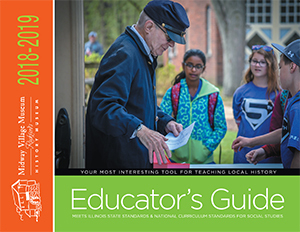 This unique local program is rich in history and structured with four learning opportunities for the students meeting the Illinois Learning Standards. 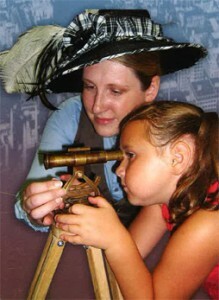 Instruction for the program is provided by museum trained historical interpreters dressed in period clothing. This outreach program is designed to solve the teacher’s challenge of not enough time to teach local history in the classroom. The four program concepts last 90 minutes and interpreters bring hands-on objects and materials for each student to use. While each of the four programs can be presented alone, it is recommended that each class schedule at least two sessions (topics) for a well-rounded experience. Teachers can choose programs in any particular order. These programs meet Illinois State Standards and National Social Studies Curriculum Standards 1, 2, 3, 4, 5 & 7. The lesson will include historical maps of northern Illinois, measuring tools, graphing activities, books, vocabulary, neighborhood mosaics and crafts. This lesson will include primary source documents, photographs, artifacts, timeline activities, books, journals, vocabulary words, crafts and music of the times. This lesson will include primary source documents, immigrant artifacts, books, tables and crafts, music, immigrant crafts and vocabulary skills. This lesson will include photographs of various local industries and laborers to evaluate and discover what we learned from them, work songs, artifacts, time charts and vocabulary skills. For more information on curriculum and program content contact our Museum Educator at 815-397-9112 ext 106. To schedule a program, please use our Tour Request Form. If you are having difficulties with the form, please send your request with all information to educator@midwayvillage.com.